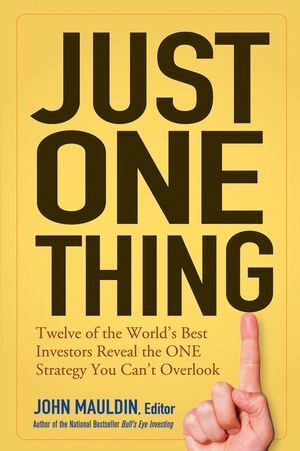 In Just One Thing, author John Mauldin offers an incomparable shortcut to prosperity: the personal guidance of an outstanding group of recognized financial experts, each offering the single most useful piece of advice garnered from years of investing. Conversational rather than technical in tone, each contributor’s personal principle for success is illustrated with entertaining and illuminating real-life stories. JOHN MAULDIN is widely recognized as a leading expert on investment issues. As President of Millennium Wave Investments, he is primarily involved in private money management, financial services, and investments. A prolific author, his books include the Wiley bestseller, Bull's Eye Investing. His financial e-letter, Thoughts from the Frontline, goes to over 1,500,000 readers weekly. He is also a frequent contributor to other financial publications, including the Financial Times and the Daily Reckoning. In addition, he authors a free letter on hedge funds and private offerings for accredited investors. A sought-after speaker on financial matters, Mauldin addresses numerous investment conferences and seminars throughout the year. 1. Signposts in the Fog (Andy Kessler). 2. The “Not-So-Simple” (But Really Utterly So) Rules of Trading (Dennis Gartman). 3. The Triumph of Hope over Long-Run Experience: Using Past Returns to Predict Future Performance of a Money Manager (Mark T. Finn and Jonathan Finn, CFA). 4. The Long Bond (A. Gary Shilling, Ph.D.). 5. Risk Is Not a Knob (Ed Easterling). 6. Psychology Matters: An Investors’ Guide to Thinking about Thinking (James Montier). 7. The Means Are the Ends (Bill Bonner). 8. The 2 Percent Solution (Rob Arnott). 9. The Outsider Trading Scandal (George Gilder). 10. The Winner’s Rule (Michael Masterson). 11. Rich Man, Poor Man (Richard Russell). 12. The Millennium Wave (John Mauldin). AUTHOR PLATFORM: Mauldin's newsletter Thoughts from the Frontline reaches 1,500,000 readers each week and is posted on numerous independent websites He is also a frequent contributor to other financial publications including the Fleet Street Letter and The Daily Reckoning. EXTENSIVE EMAIL PROMOTION: John will promote the book through e-blasts and editorial content to the more than 1.5 million names on his database. Furthermore, support from other publications and organizations (with whom the contributors are affiliated) will be used. BESTSELLING TRACK RECORD: John’s first book, Bull’s Eye Investing, has sold 42,000 copies and appeared on The New York Times (business) the Wall St. Journal (business), USA Today, and Business Week bestseller lists.